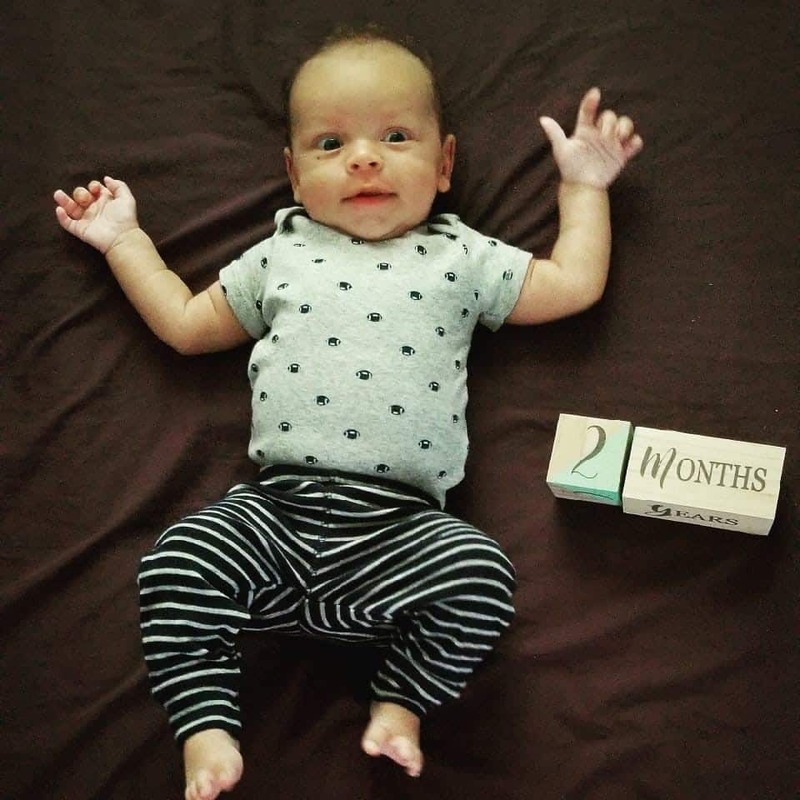 My baby was born 1 day after his guess date (Hypnobabies word for due date) on Memorial Day! I had been having practice waves (Hypnobabies word for Braxton Hicks) for a couple of weeks, but nothing consistent. So, I decide to take my 5-year-old to the city pool on the 27th of May as it had just opened on the 26th of May. I stayed in the water with him from 11:30-3:30 duck walking, squatting and enjoying feeling weightless. To my great surprise, I felt my first wave at 6:20 am on the 28th. I put on Fear Clearing (Hypnobabies hypnosis track to release fear) and decided to go back to sleep. I woke at 7:30 and timed a couple of waves (Hypnobabies word for contraction) at about 12 minutes apart. I decided to wake my husband and have him run me a bath. I put on Your Birthing Time begins (Hypnobabies track to remind you what tools and techniques to use for birthing), while in the bath. I asked my husband to call my mom as she lives an hour away and would be staying with our 5-year-old. My waves were still fairly far apart, but I thought it would be better to have her there all day than her not be there in time. I had my husband text my sister, so she was aware that it was our birthing day, but we told no one else. I didn’t want any distractions. Around 8:15 am my husband set out to get us some breakfast. When he got home, I got out of the bath, dried and ate a little. During this time, I was listening to Your Birthing Time begins. After, I spent time on my birthing ball listening to the Deepening track (Hypnobabies hypnosis track for deepening hypnosis). By 9:30 my waves were 5 or so minutes apart. I told my husband I wanted to go to the hospital when my mom arrived because I really wanted to use the jacuzzi tub there and I felt that knowing I was in the place I would be giving birth would allow me to really focus and get into the tracks. My mom arrived around 10 and we headed out. The hospital is 7 minutes away, but by the time we got there, my waves were about 1 minute apart. I tried to stay focused on the tracks. I never felt as deep in hypnosis as I would have liked, but the tracks were keeping me calm and completely able to work through each wave. When we arrived at the birthing unit, I was taken to a room and gave the nurse a copy of my birth plan. Very shortly after arriving, I started to feel sick. I did throw up one time and I felt encouraged as I knew that meant things were moving quickly. The midwife came in within about 10 minutes of my arriving. She checked my cervix which was already an 8/9. She turned off the lights and I asked my husband to put on the Pushing Baby Out track (Hypnobabies special track to deepen hypnosis) as I knew it wouldn’t be long. I hung over the back of the bed and through every wave, the midwife pushed on a spot on my foot that felt great. My husband used the Relax cue (Hypnobabies technique to deepen hypnosis) consistently and I found that to be very helpful in re-centering my focus. I am not sure how long I pushed, but by 12:20 pm I was holding my son. The Pushing Baby Out track had played through entirely once and I had my husband restart it, but it didn’t play through entirely the second time. Although, I didn’t feel as deep in hypnosis as I had previously with the tracks, I do not know one word that was said on the Pushing Baby Out track. It very much felt like the hypno-amnesia I had felt with the tracks during the course and maintenance. My husband said I seemed to instantly relax and go deeper once it was put on. I felt like I had the perfect birth. The midwife and nurse decided I didn’t even need a hep-lock (I hadn’t refused). 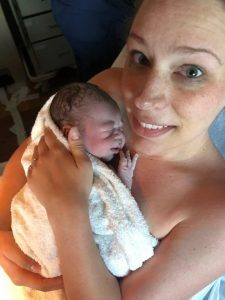 So, I got to birth my baby just as I wanted in a dim, quiet room with just myself, my husband, the midwife, and one nurse. My son was 9lbs 8oz and I had no tearing or need for stitches. I felt great after having him and was able to have a snack and call my sister directly following the birth. We were released about 27 hours after arriving! I can honestly say this birth was like a night and day difference from my first. After my first, I felt traumatized and never wanted to do it again. This time it just felt so easy.